The photos of Masi and me were taken on June 21, 1971. I went to his shop at the Vigorelli Velodome at 19 Via Arona around noon and spent the rest of the day with him and Alberto. The other little man in the shop was a worker friend of Masi. He was very nice and spoke little English. (I think there is only one shot of him). Alberto was there wrapping up bikes for the Tour de France. Eddy Merckx had been in the shop two weeks before I got there and had ordered twenty Masi bikes, so they had been busy filling that order. Merckx rode for FAEMA that year and was suppose to ride another brand of bike, but he refused to ride anything except Masi. So he had Masi build the bikes and he put another transfer on the frame to satisfy Merckx’s contract with the other team. I also saw a Masi bike that Faliero had built with Peugeot transfers and paint. Faliero said the rider was on the Peugeot team, but would ride only Masi. It looked just like a Peugeot PX10, but you turn it upside down and there was the “M” cutout on the bottom bracket. The other man seen in the photos is Masi’s business manager. He spoke very good English and was able to help me with details and explaining what I wanted on the bike, etc. Masi and I discussed what type of riding I was doing and then proceeded to write down gear ratios. To this day, I am still amazed at his ability to put together a cluster in his head and know that it will work. Of course, I still use it and haven’t changed it at all. I did change the front chain ring from his 52 to a 54 tooth. The other is a 49 tooth. Faliero asked me if I wanted Reynolds 531 or Columbus when we were discussing the bike and I asked him, “What are those over there”…pointing to the bikes on the wall. He said “Columbus”…I said let’s go with that. He told me the bike would be ready in 10 days and to come back and pick it up….that was out of the question, because I would be in England. So I left Masi with a $20.00 deposit of American Express Check for that bike. I don’t think many people would do that today. He was so kind and gracious to me. He was also so proud of the Track bike he had built and couldn’t wait to show that to me. It was Champagne metallic in color and extremely light in weight. He wanted me to buy that as well, but I told him I didn’t ride track bikes and probably couldn’t afford it as well. Speaking of price….after the bike was completed and shipped to me, the total price was 173,400 Lira which was $299.98. Of course that was 1971 money and that was a lot for me then. My bike is white, M60 on the bottom bracket, completely Campy, shipped to me in a box, complete and ready to ride. 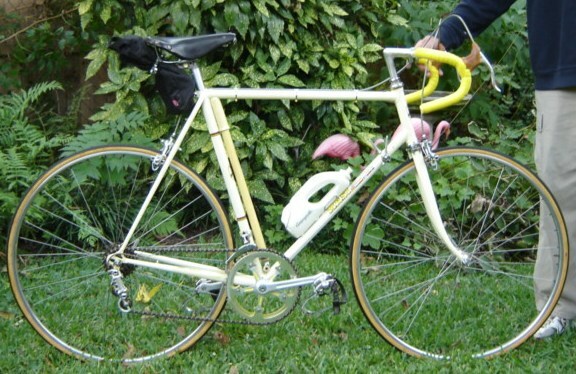 The bike was shipped 17 October 1972 from Milan by Alitalia Airlines and arrived in Dallas on 23 October. There was a labor strike in the Columbus Tube factory and it delayed things. It was a day that I will never forget….I ride the bike about 3 times a year and it still is a great thrill to ride. Jack wrote the above account, I added the captions for the photos below (click to enlarge).